Fire Dept: Former firefighter on both coasts of the U.S. Description: For a variety of reasons, I had such anger about 9/11, that I was unable to face it for a long time. Then I met somebody in a fire brigade in Australia -- like a long lost brother -- also with a burning passion for the fire service; and a deep anguish about that fateful day, and the tragic loss of so many of our fire department brothers. We have looked at 9/11 together, and he has helped me come to an understanding that I would not have found otherwise. 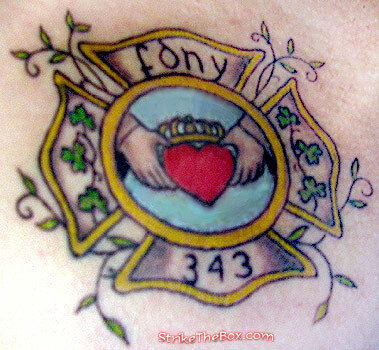 My tattoo is a tribute to the men we all lost on September 11, 2001, as well as to their families; and that shared Irish heritage with my newfound "twin," which also enjoys a notable and rich tradition in the fire service in the United States.